A couple of friends of mine were getting married, and they asked me to participate in one of my favorite ways: by making them some custom art! The challenge they offered was to build a machine which would accomplish the traditional Jewish breaking of the wine glass. 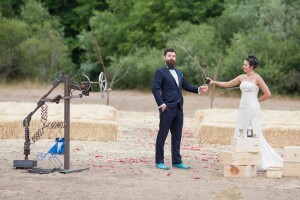 The couple are amazingly creative, and I wanted to build something that could fit their personality. I was given carte blanche and potentially a lot of rope to hang myself. Inspired by plans for a home-made forging tool I saw, I decided to implement a linear hammer mechanism and drop a big heavy metal foot down onto the glass. I had to figure out a way to power the mechanism, but I was pretty sure it needed to be hand powered. 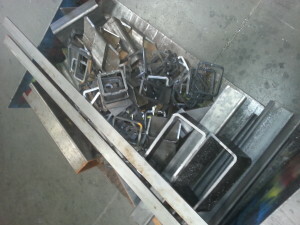 The first thing I did was head down to the metal store to pick through the remnant’s pile. There was an “artist’s corner” pile of laser cut-outs that were particularly interesting and cheap. I grabbed a big pile of random metal, knowing that I could figure out some sort of clever arrangement back at the shop. I started construction by laying out a jig to help me create the linear hammer mechanism. I knew the lengths between the joints that I was going to need, all I needed to do was fill the gaps between the holes with the interesting scrap metal I picked up. I drilled the holes in the pieces that were going to make up the joints, and slid the holes over the correctly spaced pegs I had on my jig. Then it was just a matter of finding the right pieces to make it look cool. All in all it didn’t take too much time to get the mechanism working. I welded up a stand to support the thing, as well as a box to contain the wine glass and the inevitable shards. Now I had to figure out how I was going to power the mechanism. I liked the idea of a worm gear that required lots of turns to slowly lift up the mechanism. The problem is that worm gears are generally expensive. I was going to have to create my own. I found a bronze gear in my junk pile that could work adequately as the driven gear of the worm gear. I just needed build my own worm. I set my lathe to the coarsest thread and ground down a custom bit to cut the groove. It worked perfectly. I bent a strip of steel with a tube roller to get an approximate spiral, for the cam of the mechanism to ride along. 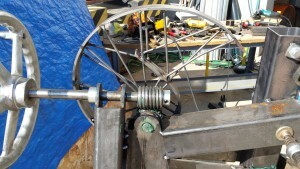 I created a hub, and welded some spokes to keep the spiral structural. As the spiral turned on the mechanism it would push the cam down, forcing the leg up. 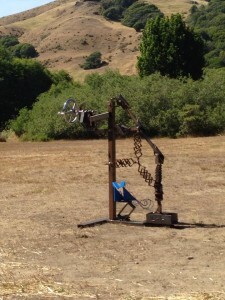 When the cam fell off the end of the spiral, “Smash!”, the foot would come crashing down. The happy couple joins in mutual glass destruction. I added a nice handwheel for something to turn and brought it up to the wedding. I didn’t think it was important to paint the thing, as the raw, almost rusted steel was it’s own patina. 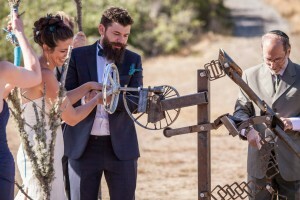 The mechanism worked beautifully at the wedding and the couple couldn’t have been happier. I was relieved I finished it in time, and pleasantly surprised by how it turned out. After the ceremony the attendees gathered around to see the thing up close. They continued to smash the glass into a pile of sand. The tradition is that the more finely the glass is shattered, the longer and happier their marriage will be. This machine definitely did it’s part. 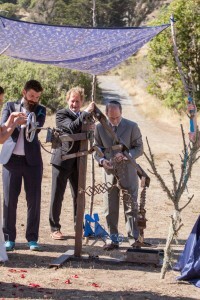 I was deeply honored to build this integral part of their wedding ceremony.